The first moth to emerge in the Butterflies & Blooms exhibition is the Atlas moth (Attacus atlas), which is native to Southeast Asia. 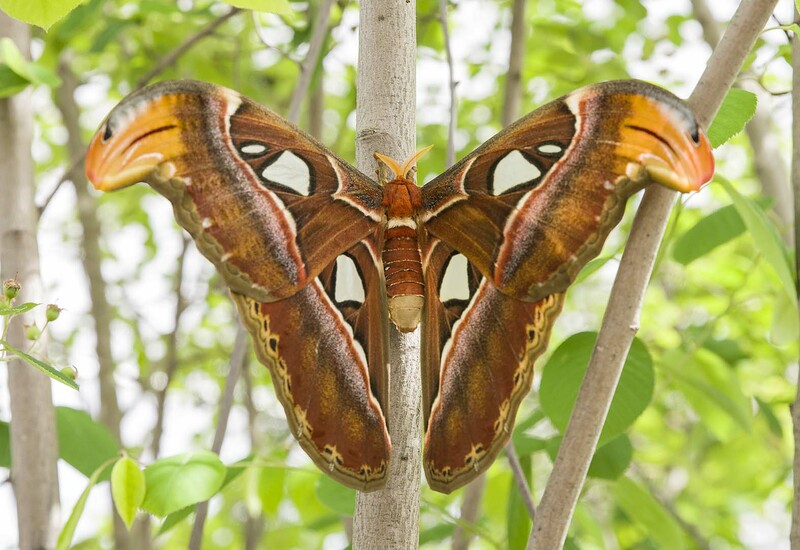 The Atlas moth lives for one to two weeks, so its main purpose after emerging from its cocoon is to mate. 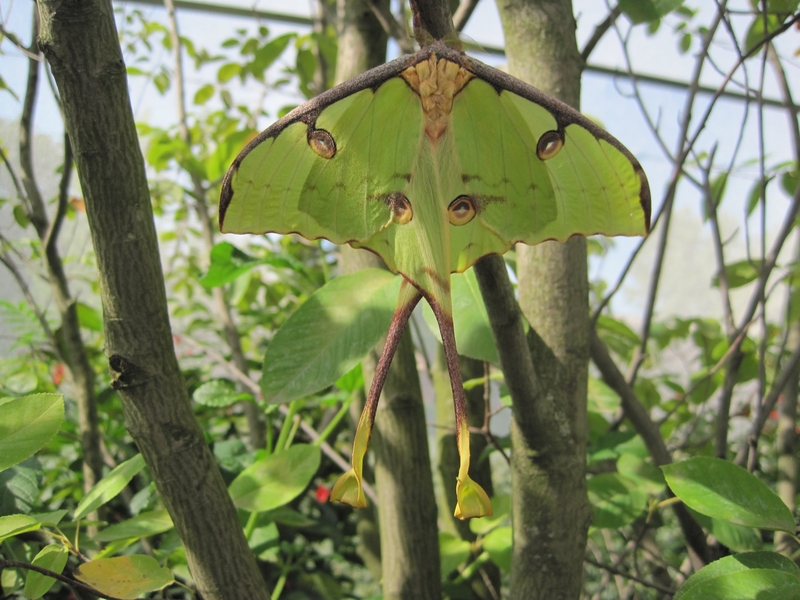 Most moths do not have functioning mouthparts, and the Atlas will not feed at all. It survives its adult life feeding off stored fat. Though not the largest Lepidoptera in the world (that award goes to the white witch moth [Thysania agrippina]), the Atlas moth comes in second with a recorded wingspan of 262 millimeters. Several other cocoons are still in the pupa emergence room, so if you do not see this moth on your visit, you may be lucky enough to see one on a return visit. We encourage you to visit often, as new butterfly species will be emerging throughout the summer! Butterflies are beautiful, magical, and mysterious creatures. They have to be one of nature’s greatest achievements. Their transformation from caterpillar to chrysalis to butterfly is truly mind-boggling when you really think about it. Seeing one is a joy. Seeing hundreds at one time is truly amazing! I had the pleasure of photographing butterflies at Butterflies & Blooms last summer. I had a wonderful time, and was just thrilled with the variety of butterflies and the quality of the plantings. When photographing butterflies, I like to look for fresh specimens on pretty perches in a well-lighted area. Even though there are a lot of butterflies there, finding one you like sitting still on an attractive surface might take some time. One approach is to find a flower that you like and position yourself ahead of time. First, set up your camera. Then, make sure there is nothing distracting in the background, and wait. Usually within just a few minutes, a butterfly or two will land in the area. Another option is to look for the kind of butterfly you like already perched on a flower or leaf. Most newly hatched butterflies will stay still on flowers or foliage while they dry, giving you an excellent opportunity to photograph them. Since this is an indoor exhibit, the structure of the building and the people walking around can often complicate shots. My favorite lenses for photographing butterflies in this situation are my 105mm and 200mm macro lenses. They allow me to be a comfortable distance away from the butterflies, get excellent details, and also keep the background soft. As with all wildlife, I always focus on the eyes. It is human nature to look at the eyes first. If they are in focus, then the whole photograph will have a more satisfying feel. If you are photographing the side of a butterfly, get parallel to the wings to keep your plane of focus aligned with entire length of the butterfly. That way you can get more of the wing details in focus without having to increase your depth of field (aperture) which would mean a slower shutter speed and possibly a soft photo. While there is plenty of light, the screen mesh does cut down the available light, and shaded areas cut the light even further. It will take some experimenting to find settings that work for you when balancing your shutter speed, ISO, and aperture to get sharp, interesting photos. To keep from getting in the way of other guests, I leave the tripod at home and handhold my camera. This means that I search for butterflies on flowers in the sun, so that I have a fast enough shutter speed for sharp photos. My most successful images come from observing the butterflies for a while and seeing what flowers seem to be the ones that get a lot of attention. There always seem to be a few plants that have more activity than others. If I’m lucky, one or two of those plants will have some nice light on them. Then I wait, enjoying the butterflies that land on me instead, eventually being graced by a few that choose to stop by and allow me to photograph them.